As a pharmacist dealing with drugs and man-made medicines, what made you focus on the herbal side? I’ve always loved herbal medicine and choosing nature where possible. So for my pharmacy degree I chose to specialise in pharmacognosy, which is the study of drugs from a natural origin, mainly herbs. After I qualified I was always recommending flower essences, herbal cough mixtures and herbs to boost the immune system and aromatherapy. For example, when I saw a patient being prescribed antibiotics, I would recommend Echinacea alongside it to help their immune system, and probiotics to take afterwards. You have to remember this was 26 years ago so my peers really thought I was slightly mad! But I really didn’t care – I believed in what I was doing and didn’t mind being different. You’ve said that homeopathy changed your life and your family’s life – in what way? I discovered homeopathy when I was 25. At the time I had recurring cystitis, constant chest infections and a cold every other month. For someone that age, I was not in great shape! Homeopathy firstly taught me that achieving proper health was not just about treating the symptoms but also looking at the root causes and considering extenuating circumstances. You need to examine a person’s emotional state (risks of stress, depression, etc), nutrition (diet, supplements), toxicity level (a body that is burdened with toxins cannot function properly) and all the bodily systems (immunity, liver, lungs, circulatory). Through supporting these areas – and identifying any weaknesses and correcting them – the whole person is treated. When I started using homeopathy and changing my diet and that of my family it was transformational. All my symptoms disappeared and today I feel healthier than when I was 25! How did skincare become part of your herbal perspective? I first learnt about herbal medicinal creams while studying homeopathy. Topical herbal creams are used extensively in homeopathy for the support of skin ailments such as eczema and bruising, which everyone knows Arnica cream can treat. I learnt how to make and use topical herbal creams for various ailments. The more I researched, the more fascinated I became with how different herbs, oils and aromatherapy oils could combine to really support the skin. It was with these principles that I would custom-make topical creams for clients. The main ailments I saw over-the-counter were acne, eczema, psoriasis and allergies, and so I created a topical cream for each of those. They worked so well, alongside the internal treatment, that I saw each customer coming back for more and recommending friends. That really was the start of The Organic Pharmacy Skincare. Manuka Face Cream, for example, is the acne cream that I made originally. It combines Manuka honey, tea tree and six different herbs. What gave you the confidence to launch the first store in 2002? It was terrifying! But I believed in it so strongly that I had no choice. I really wanted to make a difference and educate people about the choices they have to live a healthier life naturally. It was a labour of love and still is today. Over the past 16 years, ‘organic’ has become a much more mainstream concept in beauty. How do you still carve your niche? I’m so pleased it has and it’s great to see organic and wellness not just as a trend, but as a general awareness. The Organic Pharmacy is still unique in that we combine clinical with natural. It means the products are not just clean but also do what they say on the bottle. We have the expertise and know how to produce excellence. According to The Future Laboratory, claims of ‘natural’ will no longer be enough for beauty brands. In its predictions for 2018, it maintains that ‘zero-irritants’ will become the new standard in natural beauty. Do you agree? I agree and disagree… I agree that natural is not enough, but I think zero-irritants is marketing and that ultimately the consumer is very intelligent. They want something that is authentic and genuine, not marketing blurb, so I believe that clean beauty and non-toxic will continue to grow. Wellness, as a theme, will also continue as more and more people learn about what foods to eat, what supplements to take and what skincare works for them. I believe that sustainability will continue to be something that people will look for, and brands will need to become more and more aware of their ‘greenness’ as well as the ingredients they use. For me, the ‘inside out’ approach to skin care health, along with high tech and natural, will continue to grow. What’s next for The Organic Pharmacy? 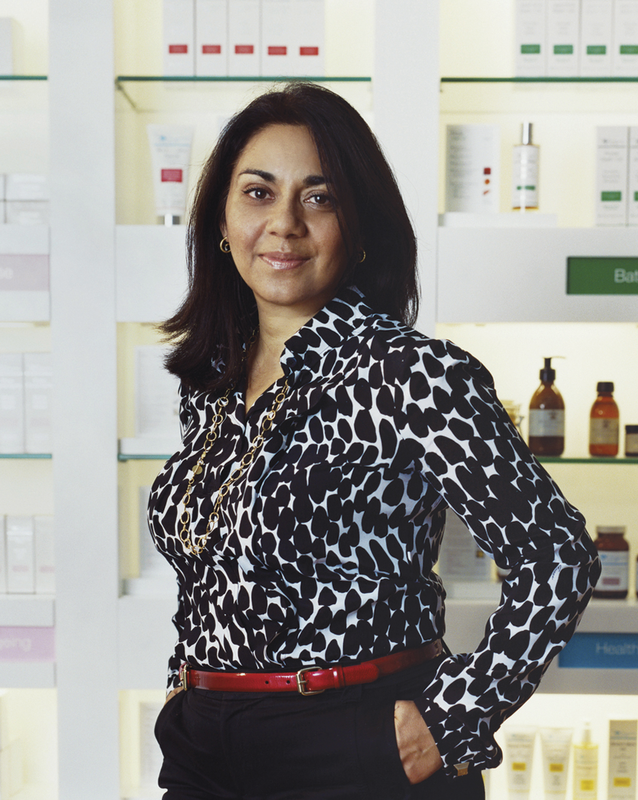 We have a new standalone spa opening in Zurich, which is very exciting as well as new high tech organic serums (specifically for pharmacies) and a brand new make-up line launching this year. Finally, what’s your favourite beauty product and why? My favourite beauty product is the Antioxidant Face Firming Serum. It is one that I formulated back in 2003 and is still fabulous to use. It is such a beautiful and powerful serum that it instantly makes my skin glow.